Growing speculation that John Kerry will receive a Nobel Peace Prize for finalizing the Iranian nuclear deal is generating renewed criticism of his close relationship with the Iranian foreign minister, Javad Zarif, a key public face for the theocratic regime who is rumored to be a probable co-recipient with Kerry. 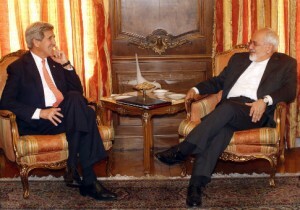 Rumors have been circulating for months that Kerry and Zarif will be co-selected for the prize. The Stockholm International Peace Research Institute, a leading Swedish think-tank, recommended in July that the two be selected for the Nobel in 2016. Lawmakers and Washington insiders who have worked for years on the Iran portfolio have reacted with shock to the rumors, telling the Washington Free Beacon in multiple interviews that both Kerry and Zarif are unfit to receive the prize. "We have seen Nobel Prizes that appeared to be awarded to people who have acted staunchly to the detriment of Israel’s existence, and if that is their inclination this time, I think Secretary Kerry should be first runner up for the Nobel Prize, right behind the Ayatollah," said Rep. Louie Gohmert (R., Texas). The Nobel Prize speculation comes after months of reports describing warmth and comfort between the American and Iranian teams that sealed the final Joint Comprehensive Plan of Action. The United States considers Iran to be the world’s leading state sponsor of terrorism and military officials have linked Tehran to the deaths of hundreds of American soldiers in Iraq. The growing rumors have reignited criticism among insiders of Kerry’s coziness with top Iranian officials and of the deal more specifically. "No one should be surprised if the Nobel Peace Prize committee ends up awarding the chief negotiators of a catastrophic agreement that preserves and legitimizes Iran’s ability to build nuclear arms, and unleashes over $100 billion for Iran to further fund Hezbollah, Hamas, Palestinian Islamic Jihad, and other terrorists who attack Israel," said one senior GOP aide who has long worked on the issue. Those who spoke to the Free Beacon both on and off the record said that Kerry and Zarif would make a mockery of the award. The recognition of Zarif in particular, a longtime Iranian regime insider known for his vociferous dislike of Israel, was particularly offensive to some observers. "I assume they’ll win it. It will be announced in early-mid October, and then Kerry can resign in glory and join the Democratic presidential race," said Bill Kristol, the prominent conservative commentator and editor of the Weekly Standard. Like Kristol, other observers feel certain that the Nobel commission will grant the award to Kerry and Zarif either this year or next. "American historians will judge Kerry as one of the worst secretaries of state in the country's history, a man who ceded enormous parts of the globe to hostile American rivals and legitimized the Iranian nuclear program," said one senior pro-Israel official who has been involved in the Iran fight but was not authorized to speak on record. "It's not a surprise that European elites, who find America’s rivals preferable to America and want to do business with Iran, are going to reward him for it," the source said. When asked this week to address the speculation, a spokesman for the Nobel Foundation declined to confirm who may or may not be in the running. "The Nobel Foundation cannot comment, confirm, or deny rumors of the kind described in your email below," the official said. "According to the statutes of the Nobel Foundation and the prize awarding institutions of the Nobel Prize all nominations are classified information," the official added, explaining that in some case nominators choose to reveal who they have nominated. Nominations for the 2015 Nobel Prize had to be made before Jan. 31 of this year, before the nuclear deal was finalized. If chosen after this date, the nominees would be considered in the 2016 cycle. "I think the work of the Nobel Committee of the Norwegian Parliament this year just got much easier," Carl Bildt, the former Swedish prime minister, tweeted immediately after the nuclear agreement was announced in Vienna. "A Nobel Peace Prize for John Kerry?" the Week asked the following day. "It could happen." Conservative commentators, such as National Review’s Jay Nordlinger, also picked up on the speculation. "If the Norwegian Nobel Committee gives John Kerry the peace prize for the Iran deal, and Iran goes nuclear, will he throw away his Nobel medal?" Nordlinger asked in August, as criticism of the deal mounted.